﻿ Red Cross Holocaust Inspection Visit to the Terezin (Theresienstadt) "camp-ghetto"
This was a concentration camp established by the SS during World War II in the garrison city of Terezín (German: Theresienstadt), located in German-occupied Czechoslovakia. The fortress of Theresienstadt in the north-west region of Bohemia was constructed between the years 1780 and 1790 on the orders of the Austrian emperor Joseph II. It was designed as part of a projected but never fully realised fort system of the monarchy, another piece being the fort of Josefov. Theresienstadt was named for the mother of the emperor, Maria Theresa of Austria, who reigned as archduchess of Austria in her own right from 1740 until 1780. 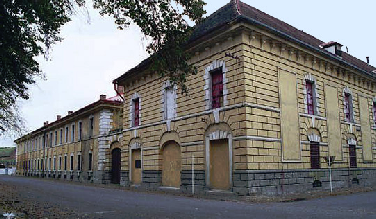 By the end of the 19th century, the facility was obsolete as a fort; in the 20th century, the fort was used to accommodate military and political prisoners. From 1914 until 1918, Gavrilo Princip was imprisoned here, after his conviction for the assassination of Archduke Franz Ferdinand of Austria and his wife on June 28, 1914, a catalyst for World War I. Princip died in Cell Number 1 from tuberculosis on April 28, 1918. After Germany invaded and occupied Czechoslovakia, on June 10, 1940, the Gestapo took control of Terezín and set up a prison in the "Small Fortress" (kleine Festung, the town citadel on the east side of the Ohře river). The first inmates arrived June 14. By the end of the war, the small fortress had processed more than 32,000 prisoners, of whom 5,000 were female; they were imprisoned for varying sentences. The prisoners were predominantly Czech at first, and later other nationalities were imprisoned there, including citizens of the Soviet Union, Poland, Germany, and Yugoslavia. Most were political prisoners. By November 24, 1941, the Nazis adapted the "Main Fortress" (große Festung, i.e. the walled town of Theresienstadt), located on the west side of the river, as a ghetto. Jewish survivors have recounted the extensive work they had to do for more than a year in the camp, to try to provide basic facilities for the tens of thousands of people who came to be housed there. From 1942, the Nazis interned the Jews of Bohemia and Moravia, elderly Jews and persons of "special merit" in the Reich, and several thousand Jews from the Netherlands and Denmark. Theresienstadt thereafter became known as the destination for the Altentransporte ("elderly transports") of German Jews, older than 65. Although in practice the ghetto, run by the SS, served as a transit camp for Jews en route to extermination camps, it was also presented as a "model Jewish settlement" for propaganda purposes. On November 11, 1943, commandant Anton Burger ordered the entire camp population, approximately 40,000 people at that time, to stand in freezing weather during a camp census (sometimes referred to as the "Bohušovicer Kessel Census"). About 300 prisoners died of hypothermia as a result. During a 1944 Red Cross visit, and in a propaganda film, the Nazis presented Theresienstadt to outsiders as a model Jewish settlement, but it was a concentration camp. More than 33,000 inmates died as a result of malnutrition, disease, or the sadistic treatment by their captors. Whereas some survivors claimed that the prison population reached 75,000 at one time, according to official records, the highest figure reached (on September 18, 1942) was 58,491. They were crowded into barracks designed to accommodate 7,000 combat troops. In the autumn of 1944, the Nazis began the liquidation of the ghetto, deporting more prisoners to Auschwitz and other camps; in one month, they deported 24,000 victims (about 18,000 in 11 transports between September 28 and October 28). The "Small Fortress" (Malá pevnost in Czech, Kleine Festung in German) was part of the fortification on the left side of the river Ohře. Beginning in 1940, the Gestapo used it as a prison, the largest in the Protectorate of Bohemia and Moravia. The first inmates arrived on June 14, 1940. By the end of the war, 32,000 prisoners, of whom 5,000 were female, passed through the Small Fortress. It was separate from and unrelated to the Jewish ghetto in the main fortress on the river's right side. An estimated 32,000 people were taken to the prison; most were usually deported later to a concentration camp. In the spring of 1942, the Nazis expelled the 7,000 non-Jewish Czechs living in Terezín, and closed off the town. The Nazis established the ghetto and concentration camp in the main fortress on the east side of the river. SS-Hauptsturmführer Siegfried Seidl served as the first camp commandant, beginning in 1941. Seidl oversaw the labour of 342 Jewish artisans and carpenters, known as the Aufbaukommando, who converted the fortress into a concentration camp. Although the Aufbaukommando were promised that they and their families would be spared transport, during the liquidation of the camp in September 1944, all were transported to Auschwitz-Birkenau for Sonderbehandlung, or "special treatment", i.e. immediate gassing of all upon arrival. The camp, Theresienstadt/Terezin, was an hybrid of ghetto and concentration camp, (KZ), with features of both. It was established by order of the SS-Reichssicherheitshauptamt (RSHA) in 1941 and administered by its GESTAPO Amt of the RSHA, Department IV-B-4, (Jews), headed by Eichmann who oversaw the ghetto and its SS-Commandant; he, in turn, was in charge of the daily ghetto administration, the SS officers, about 12, and the Czech gendarmes, who collaborated with the Germans; these last two were in charge of security and guard duties. An internal police force, run by Jewish inmates, answered directly to the Jewish self-administration and indirectly to the SS-commandant. Thus was the organisation responsible for the enslavement, deportation, and murder of the Jews. Theresienstadt was also the only KZ excluded from the control of SS Wirtschafthauptamt (main economic administration office) under Pohl and was classified as "concentration camp, class 4" (mildest). Furthermore, the SS-men in this ghetto/concentration camp were not members of the Waffen-SS usually guarding concentration camps, as reported sometimes. Pohl and the SS-Wirtschafthauptamt were in control of all concentration camps except Theresienstadt. at the New Jewish Cemetery, Prague. Gestapo and Sicherheitsdienst oversaw the day-to-day operations of the Kleine Festung, (Small Fortress), a prison of the Prague Gestapo which was controlled by the 'Higher SS and Police Führer', (HSSPF), Karl Frank, who reported directly to Himmler rather than the Office of the Protectorate of Bohemia and Moravia, a civilian department. SS-Hauptsturmführer Ernst Möhs (1898–1945) was Eichmann's liaison-officer in Theresienstadt. During the camp's operations, three officers served as camp commandant: Siegfried Seidl, Anton Burger, and Karl Rahm. As in other European ghettos, the Nazis required the Jews to select a Jewish Council, which nominally governed the ghetto. In Theresienstadt, this was known as the "Cultural Council"; later it was called the "Jewish self-government of Theresienstadt". The first of the Jewish elders of Theresienstadt was Jakob Edelstein, a Polish-born Zionist and former head of the Prague Jewish community. He served until 1943, when he was deported to Auschwitz and shot to death after being forced to watch the executions of his wife and son. The second was Paul Eppstein (de), a sociologist originally from Mannheim, Germany. Earlier, Eppstein was the speaker of the Reichsvereinigung der Juden in Deutschland, the central organisation of Jews in Nazi Germany. He served until the autumn of 1944, when he was allegedly shot in the Small Fortress on Yom Kippur. Benjamin Murmelstein, a Lvov-born rabbi from Vienna, had been part of the Cultural Council in Vienna after the Anschluss. As in other cities, the Jews were charged by the Nazis with organising actions in the Jewish community, including selection of people for transport when the Germans decided to deport them, beginning in 1942. Murmelstein was also deported to Theresienstadt. In the autumn of 1944, he succeeded Eppstein. He and other prominent Jews of the Cultural Council were deported to Auschwitz in the liquidation of the ghetto, but he and some others survived the war. He and other Jewish elders have been extremely controversial figures, condemned for years for what was seen as their collaboration with the Nazis. In the 21st century, there has been some reassessment, given the conditions of the times. The Last of the Unjust, released in 2013, is a documentary centring on interviews with Murmelstein that were filmed by Claude Lanzmann in 1975, during the production of his masterwork Shoah. The interviews were not used in the earlier film. In the last days of the ghetto, Jiří Vogel of Prague served as the elder. From 1943 to 1945, Leo Baeck was the speaker of the Council of Elders of Theresienstadt. Before being deported to the camp from Berlin, he had served as the head of the Reichsvereinigung der Juden in Deutschland. He survived Theresienstadt, and emigrated to London after the war. ... from all parts of Germany, the baggage taken away from the Jews was sent to Theresienstadt, and there it was packaged, sorted-out in order to be sent out all over the country, to various cities, for the people who were bombed-out and suffered a shortage of underwear and clothing. Among the western European Jews deported to the camp were 456 Jews from Denmark, sent to Theresienstadt in 1943. They had not been able to escape to neutral Sweden before the Nazis started the deportation. Included also in the transports were European Jewish children whom Danish organisations had tried to conceal in foster homes. The arrival of the Danes was significant, as their government gained access to the ghetto for the International Red Cross in 1944, to view conditions there. (This took place after the D-Day Invasion of Normandy by the Allies). Most European governments, when occupied by the Nazis, had not tried to protect their fellow Jewish citizens. Historians believe the Germans were trying to keep the Danes satisfied as they had impressed many of their workers in war factories. In addition, the tide of war was changing. After this, a fire department was established, made up of Jewish prisoners, with an acting fire chief. They relied on the newly constructed water system. Constructing the water system was only part of the major work undertaken by Jews, in what was called the technical service, in the first year of the camp. They had to make many more changes to buildings to adapt the fortress and barracks for the overcrowded conditions that the Germans imposed. After the changes and sprucing up to prepare for the Red Cross visit, in the spring of 1944, the Gestapo screened the Jews of Theresienstadt, classifying them according to social prominence. Many of the "Prominente" were profiled, with photographs, among a collection of documents smuggled out after the liberation.. The Gestapo reassigned some 150 to 200 prominent individuals to single rooms that would be shared by only two people, so that a husband and wife could live by themselves. Several members of the Cultural Council were included among the Prominente, due to the influence of Benjamin Murmelstein, then the "Jewish elder" of Theresienstadt. Former prisoners suggested in statements that those who held positions of authority practised nepotism, trying to protect individuals close to them, while struggling to avoid deportation and death in the closing days of the war. Murmelstein and other members of the Cultural Council were still deported in the final liquidation, but he and some others survived the war. Theresienstadt was originally designated as a model community for middle-class Jews from Germany, Czechoslovakia, and Austria. Many educated Jews were inmates of Theresienstadt. In a propaganda effort designed to fool the western allies, the Nazis publicised the camp for its rich cultural life. In reality, according to a Holocaust survivor, "during the early period there were no [musical] instruments whatsoever, and the cultural life came to develop itself only ... when the whole management of Theresienstadt was steered into an organized course." An extremely rich cultural life then ensued, with lectures, recitals, poetry readings, concerts, and so on. At least four concert orchestras were organised in the camp, as well as chamber groups and jazz ensembles. Several stage performances were produced and attended by camp inmates. Many prominent artists from Czechoslovakia, Austria, and Germany were imprisoned at Theresienstadt, along with writers, scientists, jurists, diplomats, musicians, and scholars, and many of these contributed to the camp's cultural life. The community in Theresienstadt tried to ensure that all the children who passed through the camp continued with their education. The Nazis required all camp children over a certain age to work, but accepted working on stage as employment. The prisoners achieved the children's education under the guise of work or cultural activity. Daily classes and sports activities were held. The community published a magazine, Vedem. The history of the magazine was studied and narrated by the Italian writer Matteo Corradini in his book "La repubblica delle farfalle" (The Republic of the Butterflies"). The English actor Sir Ben Kingsley read that novel, speaking on January 27, 2015 during the ceremony held at Theresienstadt to mark International Holocaust Memorial Day. Ilse Weber, a noted Czech Jewish poet, writer and musician for children, was held in the camp from February 1942, and worked as a night nurse in the camp's children's infirmary. She volunteered to join a transport of children to Auschwitz in November 1944, where she, her son Tommy, and all the children with her were murdered in the gas chambers immediately on arrival. 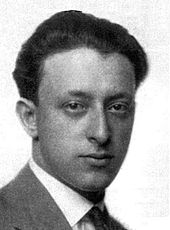 Czech composer Rafael Schächter was among those held at the camp where he formed an adult chorus. He directed it in a performance of the massive and complex Requiem by Giuseppe Verdi. Schächter conducted 15 more performances of the work before he was deported and killed in Auschwitz-Birkenau. Violinist Julius Stwertka, a former leading member of the Boston Symphony Orchestra and co-leader of the Vienna Philharmonic, died in the camp on December 17, 1942. The pianist Alice Herz-Sommer performed 100 concerts while imprisoned at Theresienstadt. She and Edith Steiner-Kraus, her friend and colleague, both survived the camp, emigrated to Israel after the war, and became professors of music, Herz-Sommer at the Jerusalem Academy of Music, and Steiner-Kraus at the Tel Aviv Academy of Music. In March 2012, a biography of Herz-Sommer was published. At the time of her death in London in February 2014, at 110, she was the oldest known Holocaust survivor. Martin Roman and Coco Schumann were part of the jazz band Ghetto Swingers. Artist and art teacher Friedl Dicker-Brandeis created drawing classes for children in the ghetto, among whom were Hana Brady ("Hana's suitcase"). They produced more than 4,000 drawings, which she hid in two suitcases before she was deported to Auschwitz in the final liquidation. The collection was preserved from destruction, and was discovered a decade later. Most of these drawings can now be seen at The Jewish Museum in Prague, whose archive of the Holocaust section administers the Terezín Archive Collection. Others are on display at Yad Vashem in Jerusalem. The children of the camp also wrote stories and poems. Some were preserved and later published in a collection called I Never Saw Another Butterfly, its title taken from a poem by young Jewish Czech poet Pavel Friedman. 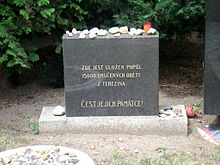 He had arrived at Terezín on April 26, 1942, and later died at Auschwitz. Painter Malva Schalek (Malvina Schalkova) was deported to Theresienstadt in February 1942. She produced more than 100 drawings and watercolours portraying life in the camp. On May 18, 1944, because of her refusal to paint the portrait of a collaborationist doctor, she was deported to Auschwitz, where she was killed. The artist and architect Norbert Troller produced drawings and watercolours of life inside Theresienstadt, to be smuggled to the outside world. When the Gestapo found out, he was arrested and deported to Auschwitz. His memoirs and two dozen of his artworks were published in 1991. The composer Viktor Ullmann was interned in September 1942, and died at Auschwitz in October 1944. He composed some twenty works at Theresienstadt, including the one-act opera Der Kaiser von Atlantis (The Emperor of Atlantis or The Refusal of Death). It was planned for performance at the camp, but the Nazis withdrew permission when it was in rehearsal, probably because the authorities perceived its allegorical intent. The opera was first performed in 1975, and shown in full on BBC television in Britain. It continues to be performed. Music composed by inmates is featured in Terezín: The Music 1941–44, a two-CD set released in 1991. The collection features music composed mostly in 1943 and 1944 by Pavel Haas, Gideon Klein, Hans Krása, and Viktor Ullmann while interned at Theresienstadt. Haas, Krása, and Ullmann died in Auschwitz concentration camp in 1944, and Klein died in Fürstengrube in 1945. In 2007, the album Terezín – Theresienstadt of music composed at Theresienstadt was released by the Swedish singer Anne Sofie von Otter, assisted by baritone Christian Gerhaher, pianists, and chamber musicians. In 2008, Bridge Records released a recital by Austrian baritone Wolfgang Holzmair and American pianist Russell Ryan that drew on a different selection of songs. Late in the war, after D-Day and the invasion of Normandy, the Nazis permitted representatives from the Danish Red Cross and the International Red Cross to visit Theresienstadt in order to dispel rumours about the extermination camps. The commission that visited on June 23, 1944, included E. Juel-Henningsen, the head physician at the Danish Ministry of Health, and Franz Hvass, the top civil servant at the Danish Foreign Ministry. Dr. Paul Eppstein was instructed by the SS to appear in the role of the mayor of Theresienstadt. Weeks of preparation preceded the visit. The area was cleaned up, and the Nazis deported many Jews to Auschwitz to minimise the appearance of overcrowding in Theresienstadt. Also deported in these actions were most of the Czechoslovak workers assigned to "Operation Embellishment". 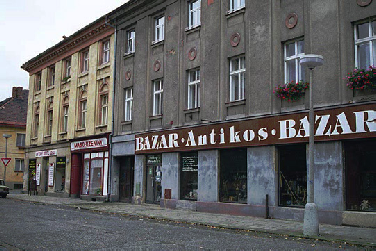 The Nazis directed the building of fake shops and cafés to imply that the Jews lived in relative comfort. The Danes whom the Red Cross visited lived in freshly painted rooms, not more than three in a room. 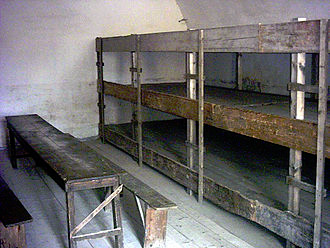 Rooms viewed may have included the homes of the "prominent" Jews of Theresienstadt, who were afforded the special privilege of having as few as two occupants to a room. The guests attended a performance of a children's opera, Brundibár, which was written by inmate Hans Krása. The Red Cross representatives were conducted on a tour following a predetermined path designated by a red line on a map. The representatives apparently did not attempt to divert from the tour route on which they were led by the Germans, who posed questions to the Jewish residents along the way. If the representatives asked residents questions directly, they were ignored, in accordance with the Germans' instructions to the residents prior to the tour. Despite this, the Red Cross apparently formed a positive impression of the town. Following the successful use of Theresienstadt as a supposed model internment camp during the Red Cross visit, the Nazis decided to make a propaganda film there. It was directed by Jewish prisoner Kurt Gerron, an experienced director and actor; he had appeared with Marlene Dietrich in The Blue Angel. Shooting took eleven days, starting September 1, 1944. After the film was completed, the director and most of the cast were deported to Auschwitz. Gerron was murdered by gas chamber on October 28, 1944. The film was intended to show how well the Jews were living under the purportedly benevolent protection of the Third Reich. If taken at face value, it documents the Jews of Theresienstadt living a relatively comfortable existence within a thriving cultural centre and functioning successfully during the hardships of World War II. They had to comply and perform according to Nazi orders. Often called The Führer Gives a Village to the Jews, the correct name of the film is Theresienstadt. Ein Dokumentarfilm aus dem jüdischen Siedlungsgebiet ("Terezin: A Documentary Film of the Jewish Resettlement"). As the film was not completed until near the end of the war, it was never distributed as intended, although a few screenings were held. Most of the film was destroyed, but some footage has survived. 10 Kronen bill shown to the Red Cross committee. Ex-inmates of Theresienstadt have described how they each received 50 crowns every month with which to buy things. Residents working at the camp were also paid in this currency, a form of truck system. Approximately 144,000 Jews were sent to Theresienstadt. Most inmates were Czech Jews, but 40,000 were from Germany, 15,000 from Austria, 5,000 from the Netherlands, and 300 from Luxembourg. In addition to the group of approximately 500 Jews from Denmark, Slovak and Hungarian Jews were deported to the ghetto. 1,600 Jewish children from Białystok, Poland, were deported from Theresienstadt to Auschwitz; none survived. About a quarter of the inmates (33,000) died in Theresienstadt, mostly because of the deadly conditions, which included hunger, stress, and disease. The typhus epidemic at the very end of war took an especially heavy toll. About 88,000 prisoners were deported to Auschwitz and other extermination camps, including Treblinka. At the end of the war, 17,247 had survived. An estimated 15,000 children lived in the ghetto. Willy Groag, one of the youth care workers, mistakenly claimed after the war that only 93 survived. 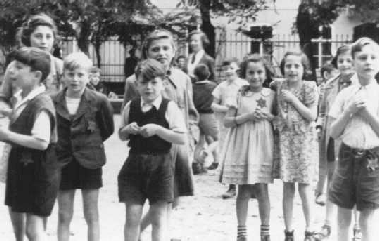 A photograph of Jewish children in the Theresienstadt ghetto taken during an inspection by the International Red Cross. Prior to this visit, the ghetto was "beautified" in order to deceive the visitors. After the war, General Dwight Eisenhower signed a one-sentence order on August 4, 1945 which read "Effective immediately all members of the German forces held in US custody in the American zone of occupation in GERMANY will be considered as disarmed enemy forces and not as having the status of prisoners of war." The DEF status meant that the German soldiers who had surrendered would not be entitled to protection under the Geneva convention: no Red Cross inspections were allowed in the US prison camps after the war and Red Cross parcels for the defeated Germans were banned by the US War Department. Even before the December 18, 1942 complaint by 12 allied governments, the Nazis had already turned the Theresienstadt ghetto into a propaganda tool to fool the rest of the world about their plans to exterminate all the Jews in Europe. Neuegasse, the street where the Cafe and ghetto shops were located. On the left is the building where there was a store in which the prisoners could buy used clothing with camp money and the building on the right is where the Cafe was located. These buildings face the town square. On May 12, 1943, a bank was opened in Theresienstadt and camp money was printed to pay the Jews for their labor in the ghetto factories. This money could be used at the ghetto cafe or to buy items at the ghetto shops. In order to give the impression to the outside world that Theresienstadt was a regular town and not a concentration camp, the Nazis decided in July 1943 to change the numbers and letters on the streets and buildings to names, so that any friends or relatives sending mail to the camp post office would not suspect anything. The camp name "Ghetto Theresienstadt" was changed to "Jewish Settlement Theresienstadt." In the Spring of 1944, the Nazis began extensive improvements to the ghetto in preparation for the Red Cross visit. In their mission to impress the IRC delegates, they outdid themselves, and after the beautification project was completed, they were so proud of their handiwork that they made a movie of Theresienstadt entitled "Der Führer schenkt den Juden eine Stadt" or "The Leader gives the Jews a town as a gift." A playground was built for the children in the Stadt park, across from the present Ghetto Museum building. 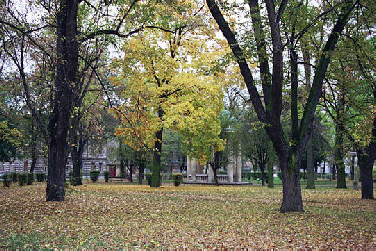 The most beautiful park in the town, Brunnen Park, was made public and the Jews were now allowed to use all four of the parks in the ghetto. With Theresienstadt now beautified, the next step was to relieve the overcrowding in the ghetto so that the IRC would not realize the actual inhuman living conditions there. In September 1943, December 1943 and May 1944, just before the scheduled visit, there was a total of seven transports on which 17,517 Jews were sent to the death camp at Auschwitz. The Czech Jews from these transports were placed in a "family camp" at the Auschwitz II camp known as Birkenau. The men, women and children were allowed to stay together in contrast to the other prisoners at Auschwitz-Birkenau who had to live in separate fenced-off sections where the men and women were segregated from each other. 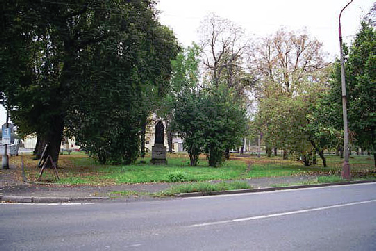 The Czech Jews were allowed to wear civilian clothes instead of the blue and gray striped prison uniforms that the other inmates had to wear. Most importantly, they were allowed to send letters back to Theresienstadt to tell the others about how well they were being treated in the camp. Six months after it was opened, the "family camp" was closed and only 1,168 of the Theresienstadt prisoners survived. The rest are presumed to have perished in the gas chamber. The Red Cross inspection of the camp lasted for six hours but the cultural events went on for a week. During the week of the inspection, there were numerous performances of the children's opera called Brundibar in the new cultural hall in the Sokol building. A jazz band, called the Ghetto Swingers, played in the music pavilion in the square. This was a real concession by the Nazis since they had banned jazz or swing music in Germany. Hitler regarded swing as "degenerate" music because two of the leading musicians, Benny Goodman and Artie Shaw, were Jewish. Unfortunately, most of the Theresienstadt Jews did not live to enjoy their new improved ghetto. In the fall of 1944, after the June Red Cross visit, the transports to Auschwitz began again. In Sept. 1944, there were approximately 30,000 prisoners living in Theresienstadt. Eleven transports, totaling 18,402 inmates of the ghetto, were sent to Auschwitz between September 28, 1944 and October 28, 1944, the date of the last transport to be sent to the gas chambers of Auschwitz. Of the Jews sent to Auschwitz on these eleven transports, there were only 1,574 survivors. The rest died in the gas chamber, were worked to death or perished in the typhus epidemics which were rampant there. After these transports left, the number of Jews remaining in Theresienstadt was around 11,000, including 819 children under the age of 15. On February 5, 1945, a transport of 1,200 Jews left Theresienstadt on passenger trains, bound for Switzerland, a neutral country in the war. Another transport of 623 Jews was sent to Sweden. By that time, the Germans realized that they were losing the war and they were trying to fool the Allies into thinking that they did not have a deliberate plan to kill all the Jews. It was around this time that the Allies were escalating their efforts to end the war by bombing German civilians in Nürnberg on January 2, 1945 and Dresden on February 13,1945. But unlike the atomic bombs dropped on Hiroshima and Nagasaki in order to force the Japanese to surrender, the Allied destruction of Germany's beautiful cities did not deter the Germans in their plan to annihilate European Jewry. Three months after their inspection of Theresienstadt, the Red Cross visited the Auschwitz death camp in September 1944 but failed to notice that the purported shower rooms there were really gas chambers. In 1948, the Red Cross released a three volume report in which the findings on the Auschwitz visit were included: "Not only the washing places, but installations for baths, showers and laundry were inspected by the delegates. They had often to take action to have fixtures made less primitive, and to get them repaired or enlarged" (Vol.III, p. 594). Apparently the Red Cross representatives couldn't tell the difference between the fake shower heads in the gas chambers at Birkenau and real shower nozzles in a genuine shower room. On March 5, 1945, Adolf Eichmann visited Theresienstadt to check out the camp before the next Red Cross visit which was scheduled for April 6, 1945. By then, there was complete chaos in Europe in the final days of the war; Theresienstadt had become shabby again because most of the inmates were elderly people or young children who were not able to work. Most of the able-bodied Jews had been sent on the transports to the death camp at Auschwitz, where there were also factories in which the Jews were being put to work for the German war effort. Eichmann ordered the town to be cleaned up again, and the ghetto passed the second Red Cross inspection with a good report. Following the second inspection, on April 15, 1945, all the Danish Jews in the ghetto were transported back to Denmark with the help of the Red Cross. On May 3, 1945, the Nazis turned the whole Theresienstadt ghetto over to the Red Cross workers who now had the unpleasant task of trying to save the survivors from a raging typhus epidemic. Typhus is caused by body lice, and the Germans had tried unsuccessfully to control the lice in the death camps in Poland by using Zyklon B, the same chemical that they used to kill the Jews in the homicidal gas chambers. Typhus had been brought into the Theresienstadt ghetto by 13,454 survivors of the eastern concentration camps who began arriving after April 20, 1945. Some of them had been sent to Auschwitz a few months earlier and were now returning. In the final days of the war, the Theresienstadt ghetto became a hell hole, where a typhus epidemic was totally raging out of control, just like the unfortunate Bergen-Belsen camp which the Nazis had voluntarily turned over to the British on April 15, 1945. In the end, the whole world learned of the true story of the Theresienstadt ghetto and the genocide of the Jews, in spite of the Nazi beautification program, or maybe because of it. was born in Braila, Romania on 27 May 1905, and was raised and educated in Brno. He went to Prague after World War I to study piano, composition and conducting at the Prague Conservatory, from which he graduated. He established the Chamber Opera in 1937 to play neglected baroque music and worked with Emil F. Burian at his Avant-garde theatre. However, Nazi persecution soon forced Schächter to reduce his musical activities to private lessons and home concerts. Schächter arrived at Theresienstadt in November 1941 and soon after began to organise singers and instrumentalists. He was a pioneer of cultural life in the ghetto, and worked with Karel Svenk and Gideon Klein among others to arrange musical activities. 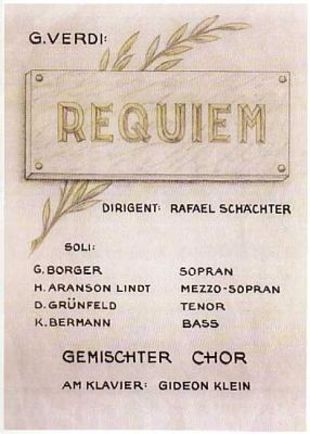 In September 1943, Schächter was ordered by the SS to conduct Verdi's Requiem, for which he organised a choir of approximately 150 singers and four soloists. Shortly after the successful performance, almost the entire cast was deported to Auschwitz. Schächter reconstituted a large choir to perform the work again, but in December was forced to recruit musicians for a third time after another transport to the ‘East’. The final group, though reduced in size, gave fifteen performances. Schächter performed and conducted a range of additional musical performances in Theresienstadt and was mentioned in several of Viktor Ullmann’s critiques. In October 1944, the SS asked Schächter to stage Verdi’s Requiem again, this time for the Red Cross, with Eichmann and several other top SS officers present. It was with this last choir that Rafael Schächter was finally transported to Auschwitz along with several other Theresienstadt musicians. All were killed on arrival. In April 2005, the conductor Murry Sidlin conceived, wrote and conducted Defiant Requiem: Verdi at Terezin, a performance to honour Raphael Schächter. In the sheltering darkness of the long evenings, they were together in the cold and gloomy attic of a barrack, close under the roof. There they stood, pressed close to each other, to hear a talk about the Bible and the Talmud, about Plato, Aristotle, Maimonides, about Descartes and Spinoza, about Locke and Hume and Kant or about days and problems of history, about poetry and art and music, about Palestine of old and today, about the Commandments, the Prophets, and the Messianic idea. All those hours were hours in which a community arose out of the mass and the narrowness grew wide. Theywere hours of freedom. A TV story on composer/conductor Murry Sidlin's production of Verdi's Requiem as performed by the prisoners of the Terezin concentration camp in Germany during WWII. Terezin (T0heresienstadt) "camp-ghetto" existed for three and a half years, between November 24, 1941 and May 9, 1945. Neither a "ghetto" as such nor strictly a concentration camp, Theresienstadt served as a “settlement,” an assembly camp, and a concentration camp, and so had recognizable features of both ghettos and concentration camps. 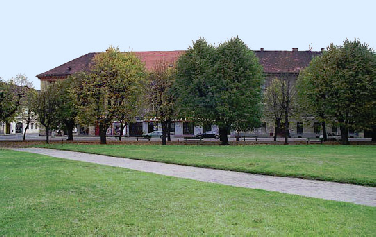 In its function as a tool of deception, Theresienstadt was a unique facility. Theresienstadt served an important propaganda function for the Germans. The publicly stated purpose for the deportation of the Jews from Germany was their "resettlement to the east," where they would be compelled to perform forced labor. Since it seemed implausible that elderly Jews could be used for forced labor, the Nazis used the Theresienstadt ghetto to hide the nature of the deportation. Beginning in 1942, SS authorities deported Jews from Theresienstadt to other ghettos, concentration camps, and extermination camps in Nazi-occupied eastern Europe. Fifteen thousand children passed through Theresienstadt. Although forbidden to do so, they attended school. They painted pictures, wrote poetry, and otherwise tried to maintain a vestige of normalcy. Approximately 90 percent of these children perished in death camps. Once the visit was over, the Germans resumed deportations from Theresienstadt, which did not end until October 1944.